Born in 1970 in Qatif city, Saudi Arabia. 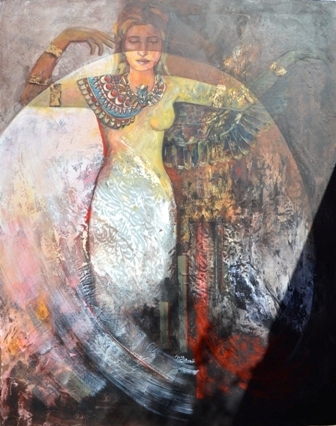 Mahdiah started her artistic career in the year 1992; she set up 5 personal galleries and participated in many others both on the local and international level. She trained a lot of trainees in the many fields she is experienced in “Fine Art, Drawing, Sculpture, and Graphic Art”. Mahdiah established her atelier (Almada – Mhd Alfnon) in 2006, on an area measured 305 meters, which contains 109 of her paintings and 65 displayed sculptural works, she organize and present training courses, activities and events throughout the year. She received numerous awards and many Arabs and foreigners have collectibles from her paintings and art work. - Collection of Painting art participations since 1992. - Collection of Sculpture Art participations since 1999. -2010- The personal exhibition "Ahazij Sunbulah" at Qatif Arts Club. Peace" at Qatif Arts Club. - 2013- The personal exhibition "Shadows of Dust" in Salala, Oman. -2010- Acquisition award in the Sculpture Gallery II, in Riyadh. -2010- Acquisition award in the third competition of Al-Safir. - 2014- Award in Kuwait international art symposium Souad Al-Sabah creative award.